Kodak Load Instantly Christmas Ad 1965 This is a December 3, 1965 advertisement Shows a lady focusing a camera and it reads, Load instantly, automatically and save your Christmas in clearer brighter movies than ever before."" The Mother is taking movies of her little girl holding a Santa doll.. In excellent condition. Photo is taken through plastic and may show wrinkles or crookedness that is not in the ad. This magazine tear sheet measures 10 1/4"" wide by 13 3/4"" tall. 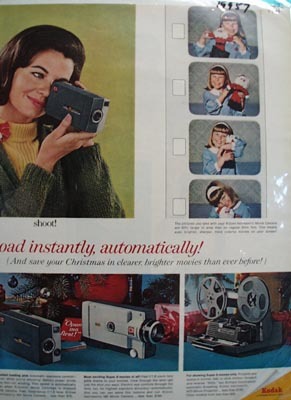 Items Similar To "Kodak Load Instantly Christmas Ad 1965"